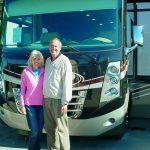 Thor Motor Coach Challenger RVs for Sale at Motor Home Specialist, the #1 Volume Selling Motor Home Dealer in the World as well as #1 Thor Motor Coach RV dealer. The Thor Challenger is a luxury class A gas RV. While you might not be able to control the environment you are driving through, you can certainly control the quality of the ride. The Thor Challenger gives you that control. The Challenger brings with it an abundance of creativity as well as over two decades of history. It is the best of both worlds. Take Control of Your Trip in the Thor Challenger. Being in control can not only make you feel powerful, it can increase your safety and security. The Thor Challenger comes with a rapid camp remote system, so you can take control no matter where you are. With this control, you can move the slide rooms, leveling jacks, and even the patio awnings with just a click of a button - even if you are outside of your motor coach. In addition, you will find features on the Thor Challenger that one normally only finds in a diesel motor coach. This means you can save money on fuel without giving up the extras. Let Your Creative Side Bloom in the Thor Challenger. Your new motor coach is your home. Whether that means spending months on end or even a week at a time, it is still your home away from home. That's why it is essential that the floor plan of your motor coach gives you the most space and comfort as possible. The Challenger RV is available in a myriad of awesome floor plans including for the 2016 lineup the 36TL, 37GT with island kitchen, the ever popular 37KT with dual living and sleeping areas, the 37LX bath & 1/2 RV and the new 37TB bath and 1/2 bunk model RV. Made to Fit. You'll find that the creative floor plans of the Challenger will meet all of your needs. From plenty of kitchen countertops to massive exterior storage, the design team has taken everything into consideration. Additional features may include: Residential appliances, Wide open spaces, Stow-Away table between Captain's Chairs and power drop down bunk in the cab area. Ride in Style with the Thor Challenger. It is time to shake things up a bit and challenge the status quo. There's no better way than to check out the Thor Challenger and ride in style. Go ahead and take the time to learn more today. You may also want to check out the Thor Motor Coach Miramar models as well. Click here to view Thor Motor Coach Challenger RV Reviews.